Death From the Skies is the newest supplement to be released by GW. Unlike the other supplements, this one actually changes the core rules for all of the GW Flyers in the game (note: Flyers does not include FMC's). Let's see what these changes have done for our Tau. As you've probably heard, every flyer has new characteristics. Agility and Pursuit are added stats that are used in the new Dogfight phase (more on that later). Each flyer is further classified into either Fighter, Attack Flyer, or Bomber. For now, Fighter matters the most since it allows you to Skyfire. Currently, Attack Flyer and Bomber do not have Skyfire. First you check if you'll have a dogfight phase. It only happens once per game turn, if you both have fliers in reserve, and at least one of you wants to have a dogfight. If you disagree you roll off. Another rolloff. This is where the winner gets the chance to choose what enemy flyer they will fight. Having Fighters is best for this phase since it gives you a boost, while bombers hurt you. Again. Pick a number, reveal, consult table. This time if you have to do a further roll-off it pays to have higher agility. The winner gets to either Jink or rotate the enemy flyer, usually up to 90 degrees but the super agile flyers can rotate the enemy 180 degrees. Thankfully, Jink does not last past the Dogfight, so if that flyer comes on this game turn it can shoot normally (unless it Jinks again). So if you wanted out of the dogfight, and you weren't able to disengage, this is your chance to Jink and mitigate some of the damage you'll take. If you lost both sub-phases then you are in trouble. Once, more pick and number and consult the table. This dictates the order you shoot at each other. In general, the Attacker is going to be a Fighter type so most of the time they will also get to shoot first against other flyer types. The nifty thing here is that if you won the Maneuvre phase then your opponent didn't get the chance to Jink so your weapons will be more effective. Once again, most of the time the Fighter type will get the advantage here, since the Attack Flyer and Bomber types will almost always be firing Snap Shots whether they Jinked or not. Damage is handled normally. If a flyer is destroyed it could crash and burn somewhere on the battlefield, possibly scattering onto someone's units. Passengers are destroyed with the Flyer. 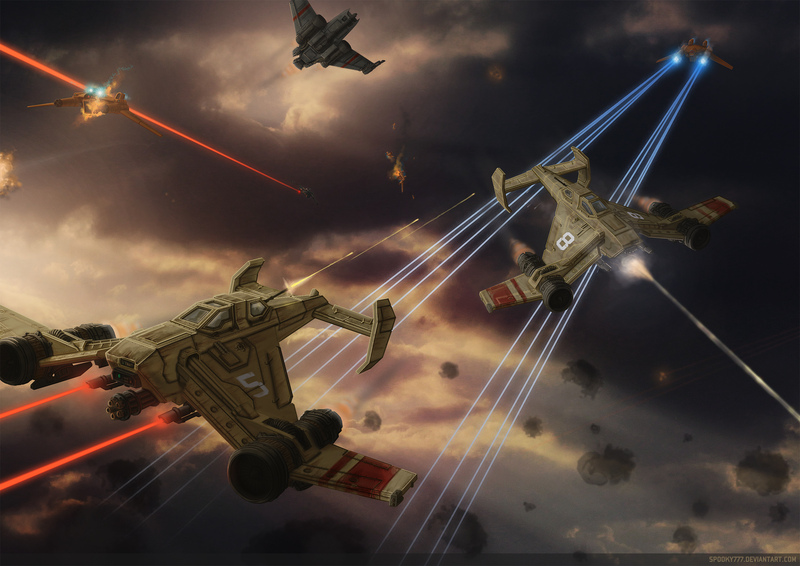 Tau do not currently have a Fighter, which (in case you haven't noticed yet) is a huge disadvantage in the Dog Fight phase. Razorshark: Attack Flyer with Agility and Pursuit of 3. This seems to make sense. It mostly targets the ground with its turret weapon. Sunshark: Bomber with Agility and Pursuit of 2. The Interceptor Drones give it some actual punch in the dogfight, which ironically makes it a better Anti-Air choice than the Razorshark. They get to shoot first, always have skyfire, and since your opponent will almost never have Jinked, they have a chance to do some real damage against lighter fighters. Forgeworld Flyers: It is rumoured that Imperial Armour 14 will drop at the end of this summer (2016) which is fantastic news since it is supposed to be Tau vs. Admech! This should update all our decent flyers, but in the meantime we can hope for an FAQ soon. Our flyers are so bad that they would probably not survive a Dogfight phase with any kind of Fighter. Necron Flyers appear to be about as bad as our own, but Necron players aren't the ones you need to worry about. The Razorshark might have a chance against most bombers, but all the bombers in the game just became bad as a whole, so you're not likely to face one. The Sunshark presents a weird situation where it is a horrible flyer, but its drones give it a bit of an edge against lighter flyers (aka Fighters). If you have to take a flyer, take the Sunshark, since the drones are the only way of getting Skyfire and they just might actually kill an enemy Fighter before it hoses your Sunshark. IMO, it is probably still too expensive and you might be better off eating the -1 to your reserve rolls if your opponent happens to bring a flyer. Of course, it is unlikely that all of these rules will be used in competitive tournaments like ITC events. We'll see in June which rules get used and which ones get shelved for tournament play. are immediately destroyed if the Sun Shark is destroyed." Wow I totally missed that section of the Tau appendix. I'll correct the post. Thanks! New Tau Barracuda from Forge World! Warhammer 40k 7th Ed FAQ!